A controversial penalty award robbed Racing Club of any chance to get something from their top-of-the-table clash at home to Atherstone on Saturday. The home side were trailing 3-2 in front of a season-high crowd of 386 when goalkeeper Charlie Bannister launched the ball downfield after a Adders counter-attack had broken down in the 89th minute. With manager Scott Easterlow having moved defender Scott Turner up front, the hosts were poised to lay siege to the Atherstone goal. However, any thoughts of a dramatic leveller were quickly extinguished when referee John Roskelly stopped play to go back and talk to Bannister. A red card was then produced for the keeper’s verbal abuse of an assistant referee and to the bemusement of both sides a penalty was awarded. Joe Obi duly sent stand-in keeper Joe Smith the wrong way from the spot to send Atherstone four points clear at the top of Midland Division One. 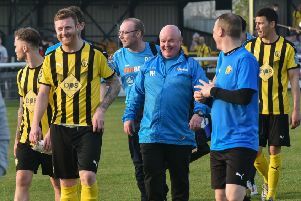 Although manager Scott Easterlow accepted his side were well below their best, his frustration at seeing their 12-match unbeaten run come to an end in such a bizarre fashion was evident. “We never deserved to win to be honest,” he admitted. “But when you stay in game while not playing well and that decision kills you off it’s frustrating. Two goals inside seven minutes just after the interval proved crucial in the overall analysis after the sides had gone in at the interval locked together at 1-1, Alex Naughton’s free-kick having cancelled out Rich Powell’s 17th-minute opener. Ryan Quinn looked to be well offside when he poked home Atherstone’s second in the 48th minute, moments earlier having been denied by a fine reaction save by Bannister. Naughton then broke the offside trap to make it 3-1 before Racing Club were handed a lifeline in the 63rd minute, Luke Cole volleying Wade Malley’s cross into the far corner of the net. Bannister, who had produced a couple of outstanding stops in the first half, was at his best to tip a Jake Wooley free-kick over the bar in the 67th minute, while Marc Passey’s shot proved awkward for James Beeson at the other end. Jonathan Gould then grazed the near post as Atherstone looked to put the game to bed. Trea Bertie produced a great touch to bring the ball down but his first-time shot had some of the pace taken off it to make it easier for Beeson. However, any hopes of a grandstand finish from the hosts were quickly dashed by Bannister’s indiscretion and the referee’s misinterpretation of the laws of the game.